Well it seems the whole nation has got on board with ‘Waistcoat Wednesday’, prompted by Gareth Southgate’s preference to wear them, so I thought that I’d firstly join in too (see my quick snap below) and secondly share some tips for both men and women on how you can wear them! I haven’t really given waistcoats much of a thought when putting together my own outfits lately, so I was surprised to find that I actually own three waistcoats, two more formal structured ones and this white and blue patterned one! So it’s been great fun putting together a patriotic red, white and blue outfit including said waistcoat today! Straighter body shapes – waistcoats are great for you, particular those which have darts at the waistline, which will give the illusion of more curves. There are a selection below from Jow Browns and a denim one from Bon Prix, an inexpensive addition to your wardrobe at just £12.99 and a different way to do the denim trend if a denim dress or shirt don’t take your fancy. 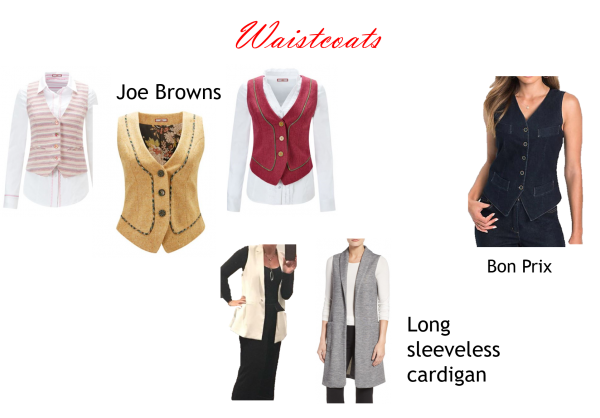 A long waistcoat/cut off jacket or cardigan works wonders for creating a slimmer and longer silhouette. By creating a column of colour in this way the body appears taller and slimmer. Waistcoats are often thought to be a traditionally male wardrobe piece, and I have to say I rather like the smartness that a waistcoat adds. Whether it’s worn with a shirt and tie and no jacket (as per Gareth Southgate) or as part of a three-piece suit, it can look incredibly polished and professional. A CEO I saw recently told me that he preferred a waistcoat to a jacket as it was more comfortable, he enjoyed the freedom of being able to move his arms around rather than feel restricted by a jacket. It still ticked his boxes of looking like a leader and presenting a professional image, but also showed his more creative side too. Waistcoats can also add a something extra when worn more casually too. Worn with a pair of jeans they add fun to what would otherwise be simply jeans and shirt or t-shirt. 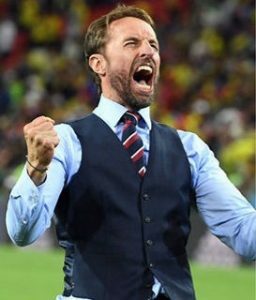 So don a waistcoat today and enjoy cheering on our boys tonight … it’s coming home …!